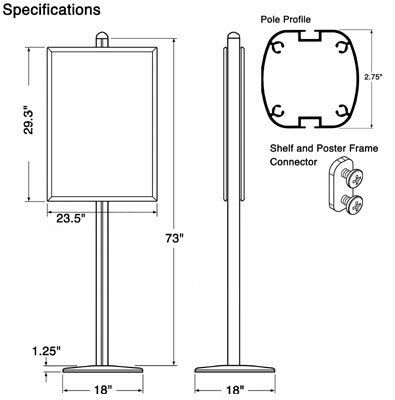 FORTE Snap Frame Display Stand: 22"x28"
This FORTE snap frame display stand allows to you display your 22" x 28" posters without hanging them from a wall or ceiling. 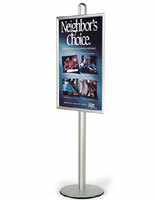 The FORTE snap frame display stand is comprised of a large aluminum pole and heavy base that hold a single snap frame. Grooves on the pole let you adjust the frame to the height that you would like. 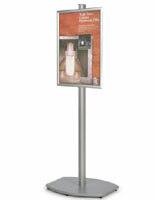 A poster display such as this snap frame display stand can be moved around to make use of your floor space. 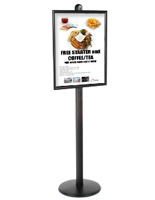 Other poster displays are static and cannot be easily removed from a location once set up. 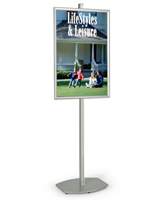 The snap frame display stand makes a great addition to trade show or in-store displays! 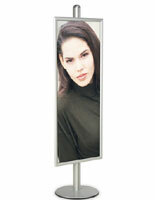 While this unit can be moved around, it also is an extremely stable and durable display once situated. 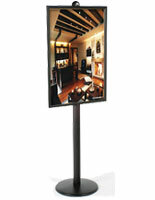 The pole stands a tremendous 72" tall and combined with the base, weighs 25 lbs. 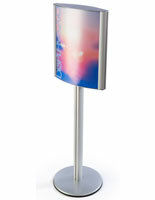 Therefore, the display stand is a solid, heavy duty display that will not falter easily. The bottom of the base is lined with a rubber ring to prevent scratching to the floor. 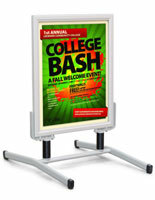 The snap frame holds 22" x 28" posters or signs. Each of the sides snaps open for easy loading. A plastic overlay protects your poster inside the frame. 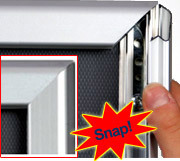 To attach the snap frame to the pole unit, loosely screw the connectors to backside of the frame at the top and bottom. Remove the cover at the top of the pole and slide the screws and connectors along the groove in the pole. Adjust to an appropriate height and tighten!